Partly printed Document Signed “Julius Caldeen Gunter” 2pp. 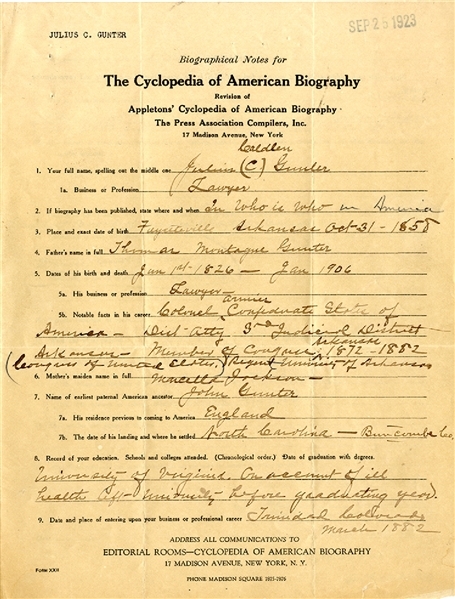 quarto, September 23, 1923, being a form for “Biographical Notes for The Cyclodpedia of American Biography Revision of Appleton’s Cyclopedia of American Biography” with good biographical content for this governor. Fine condition. Julius Caldeen Gunter (1858- 1940) was the 21st Governor of Colorado from January 9, 1917 until his term ended on January 14, 1919. Gunter helped organize the Colorado Home Guard, the Colorado Wartime Council, and the Council of Defense which were to aid the troops. He was also the first Governor to implement the use of the National Guard.